This artist's illustration is FAN-DAMN-TASTIC. They feature hip hop inspired art and gave our local group a shout out on "Digg"... and yes we can dig it! AWESOME art! April 5th Rally Update Soon! JOHN BENNETT for Detroit. Fighter for truth, knows all about Detroit, and a veteran public servant dedicated to uncovering ineffective government. A bonus: as a former DPD he is one of the few with real working knowledge of the city, and he is NOT RELATED to Kwame Kilpatrick. See also -- fyi. There are over 450 comments in queue regarding the ongoing hearings. Wayyy too much to try and include all of them in one post, so here’s a recap, and an image submitted from Sharlene in Detroit which pretty much sums up the general concensus on these proceedings (at end). The two most FAVORITE council members are: President Kenneth Cockrel and Sheila Cockrel. Why? Because they HAVE a brain. There are several other council members who also conveyed they were willing to get at the truth. And Monica Conyers was NOT one of them – which leads us to the next point. The LEAST favorite council member by unanimous public comment is: (see also comments posted here and here) — Monica Conyers! Why? B-I-G agenda. And also, for pursuing uninformed lines of questionings that clearly were intended to divert the public from the facts. Like instead of asking for FACTS of execution of Colbert-Osamuede, she asked, “so tell us what you have learned from this experience? what can the council do to improve in the future?” WHAT! This was an offense to many citizens all of whom were wondering where she got a law degree –WONKA SCHOOL? Yes we all learned today that anyone can steal 9 million from the City of Detroit and get away with it if they are Monica Conyers friend. Her “photo feature” on Kilpatrick’s Detroit (in) justice Fund website isn’t helping change public view along with her biased approach to this issue that favor’s sweeping things under the rug instead of: THE TRUTH. RE: Representing the City, Attorney McCargo: BUSTED. Sorry, no one really believes your hype that “you didn’t know” despite you expressly REQUIRED the prosecution to split the settlement agreement into 2 SEPARATE documents with intent to hide information. Stefani was happy to settle the FIRST TIME as everyone is aware. City of Detroit’s counsel are the ones that sought all the convoluted agreements and why? Because Kwame was GUILTY of something. Duh. Also by the way, responding to every other question the council asked of you with the pat answer of “I can’t answer that under attorney client privilege” is hiding. Behind technicalities. RE: City Attorney Valerie Colbert-Osamuede: BUSTED. Another one that sat there with repeated feigns of ignorance. “Gee, I didn’t know about the secret agreement even though I signed off on your behalf for it, I will excuse myself before the whole world under the auspice of ignorance because I didn’t know about it even though I choreographed it and signed it, and I didn’t know that I should inform y’all at city council about this 8.4 million dollars.” Wah… Right. A local resident describes her testimony best, “I’m positive that I didn’t know what I knew about a secret deal when I knew that there was something to know, but I didn’t know that I should know what I knew when I knew that it was pertinant to know. I can only recollect what I knew at that time to be correct that I knew that there was nothing to know that I should report anything if I didn’t know what I knew. Had a I known what I knew I would have probably known it and I could have told you but since I only knew what I now know I gave you all of the information.” Yep, this sums up the whole 4 hours of it. And here’s the submission of the day entitled: D is for Decepticons — by Sharlene. Just in from the Free Press, a local man from St. Clair registered the name “DETROITJUSTICEFUND” with the State of Michigan; for $20.00. Unbelievably, for the $750 dollar an hour Kwame is paying Webb plus the other millions of dollars it is costing for him to retain the other dozen or so on his defense team, NONE OF THEM REGISTERED THE NAME with the state. Detroit Mayor Kwame Kilpatrick’s legal defense fund has suffered its second setback in the week since the mayor announced its creation. … A St. Clair Shores man said he plunked down $20 with the state of Michigan to register the name the “Detroit Justice Fund,” which Kilpatrick had said he would use as the name of the account he would use to collect cash to defray the sizeable legal expenses he is anticipating as he defends himself from 8 felony counts. I cannot believe it’s not BUTTER! Hello? If you are organizing as a non-profit (which they did) and you are publically SOLICITING money from the public, don’t you know you need to also register your name with the state? The Kwamedy Hour – Is Kilpatrick Serious? Wanda’s Words: Detroit You So Crazy! Kwame Kilpatrick’s Collage of Accomplishments and Revenue Agenda of Fining Senior Citizens! VIDEOS: Brawl At City Council Today – Popcorn? Somebody help me, but who are these racist people against KK that he is speaking of? Who is the "lynch-mob"? The media?The last time I looked, Detroit was 85% Black, so I'm not understanding his logic here. If he's trying to use the "them" against "us" trickery, it's not working in this instance. If KK really cared about "his people", then why do the neighborhoods that "his people" live in look like war zones and wastelands. If he really gave a damn about "his people", why hasn't he provided better city services to protect "his people" from harm. If he gave a damn about "his people" why is he over-taxing and over-charging "his poor people" of Detroit? "I hope that our "leaders" are proud of the decision they made to help this mayor be re-elected. These individuals owe the entire community an apology, along with a plan to ...move Detroit forward." 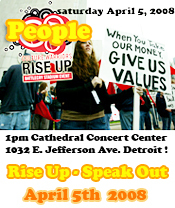 - Detroit, MI"
Let us remember that "A technical objection is the first refuge of a scoundrel. 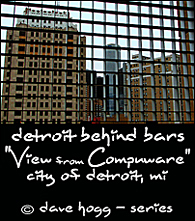 (quoting) Heywood Broun, New Republic... - Detroit, MI"
Kwame is a legend in his own mind. He will go down in Detroit history as the worst Mayor the city has ever had. - Detroit, MI"
"I can see the president of the United States, but certainly I can't see a mayor having that many." - Patrol Dispatcher Detroit"